Timing is everything, and location is almost as important. Where you decide to leave your car and what time of day it is are two of the biggest risk factors for your vehicle and any possessions inside it. Although car theft and break-ins do happen during the day, they are much more common at night. Under the cover of darkness thieves can prowl cars and remain mostly unnoticed. They have more time to scope out a situation without as many people coming and going who might notice them peeping in your windows. Park in areas with good visibility when possible. Thieves don't like feeling exposed, so they are more likely to prey on cars that are in shadows, behind bushes or have obstructed visibility from neighbors and folks passing by. Don't forget to lock your doors and roll up your windows. The one time you forget to lock up will be when you came back to find that your car has been burgled, or worse-yet, it just gone! Take additional measures to keep thieves from stealing your car by using The Club on the steering wheel. This is an old and very simple solution, but a very effective one to keep some one from stealing your car. 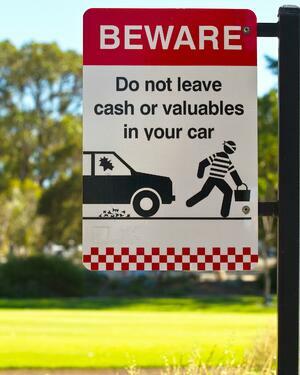 Anything that might be considered valuable should not be left in your car, or at the very least should be well hidden. This means, cell phones, jewelry, GPS devices, purses or even just a few dollars cash in the tray is enough to temp someone to break in. Even the possibility of valuables in the form of an empty bag or tote left visible can be enough to convince a thief that it's worth breaking in to find out what might be inside. This should be obvious, but don't leave your car running while you are away from it. During the winter some people have the habit of leaving their car running to "warm up" while they finish getting ready inside. This is a very dangerous habit. It's just way too easy for some one to hop in and drive off before you even notice. It's not just new or fancy cars that are targeted by thieves, your old junker can be just as enticing. Older cars are easy targets. They are easier to break into, they are less likely to have alarm systems, and they are less complicated to hot-wire. The Honda Accord and Civic models from the mid to late 1990's are the most stolen cars of all time. Get one. They are so cheap now and available for any model of car with varying degrees of quality. Something as simple as a blinking red light on your dash will deter thieves at least to a point. If a blaring car alarm goes off when they break a window or try to jimmy a lock the odds you get to keep your stuff goes way up. Some cars have become almost impossible to steal through smart key technology. When you go car shopping take this option into account. It may cost a little extra but it's one of the few options that has some serious benefits to the security of your vehicle. If your car is stolen, and you have comprehensive coverage on your auto insurance policy, your loss will be covered. Depending on the particulars of your policy, the stuff that was in your car when it was stolen, may not be covered. The beauty of Renters Insurance is that a good policy covers items stolen from your car and not just the items in your Redding and Chico apartments. Check out our Renter's Insurance 101 guide to learn more about your options.